Arianne is a GIS and spatial data analyst with more than 10 years experience as an academic working on research problems for the mineral exploration industry and government organisations. In her position as a Senior GIS Analyst for Kenex, she provides expertise in GIS-based mineral potential mapping projects and spatial data analysis. 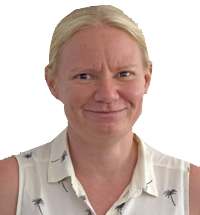 She has been involved in a number of projects for both industry and government clients primarily in the context of developing exploration targets and pre-competitive geoscience datasets for varied styles of mineralisation globally. These projects utilise all available geoscience data such as geology, structures, geophysics, remote sensing, geochemistry, and petrology while maintaining the relevant geological context to avoid producing meaningless results. Other projects have involved using GIS-based techniques for assessing sustainability in the exploration and mining sector and running GIS and spatial data analysis training courses. Her capabilities include: capturing, validating, and managing spatial data, relational database design and management, programming skills, and advanced spatial data analysis and spatial statistics using state of the art software packages.